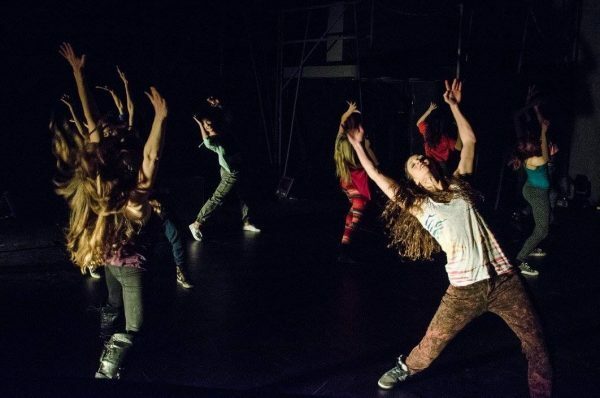 An architecturally significant house goes FLUX in West Hollywood, all things about love in Lincoln Heights, flamenco in Silverlake, an artist’s paintings inspires dance in Santa Monica, Cinderella goes underground downtown, and more SoCal dance this week. Valentine’s Day officially may be over, but dancer/choreographer James MahKween believes it is never too late for Love Inclinations, the title of a curated assemblage of dancers, musicians, singers, poets and others who agreed to perform under the theme of “love.” Announced participants include Deborah Brockus and her BrockusRed, Juli Kim, Latrice Postell, Joy Williams, and Thomas Davis. Brockus Project Space in the Brewery Arts Complex, 618 Moulton Ave., #B, Lincoln Heights; Sat., February 16, 8 p.m., $15 at door or Venmo @james-MahKween. James MahKween’s Love Inclinations. Photo courtesy of the artist. Live vocals from Lourdes Hernández (a.k.a. 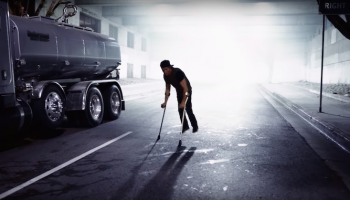 Russian Red) for the premiere of artistic director/choreographer Danielle Agami’s newest, a blind Lady, plus live music by Wilco percussionist Glenn Kotche for Agami’s calling glenn highlight these Ate9 performances. 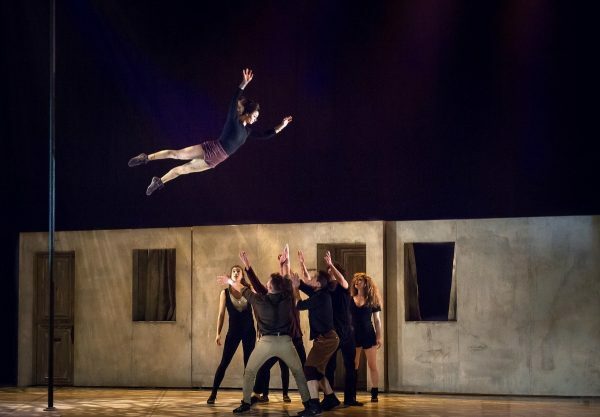 Known for her background with choreographer Ohad Naharin and her choreography for Ate9 employing Naharin’s dance approach known as gaga, Agami’s ten-member troupe returns home briefly before continuing on a national tour that includes New York, Illinois, Minnesota and Massachusetts. The Friday show includes a post-performance conversation with the artists. 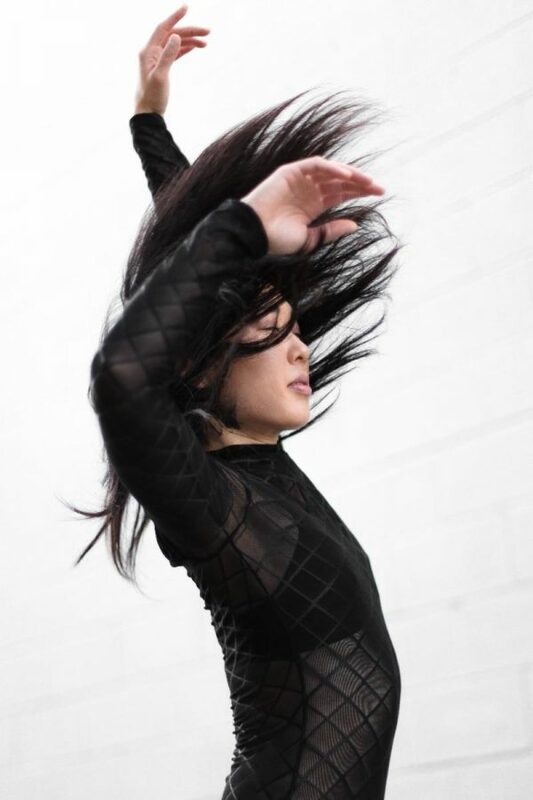 Info on Ate9 at https://www.ate9dancecompany.com. Wallis Annenberg Center for the Performing Arts, BramGoldsmith Theater, 9390 N. Santa Monica Blvd., Beverly Hills; Fri.-Sat., Feb. 15-16, 7:30 p.m., $29-$89. https://tickets.thewallis.org/single/PSDetail.aspx?psn=11885. Ate9 in “calling glenn.” Photo courtesy of the artists. The interplay of the architecture contained in R.M. Schindler’s famous concrete “Slab-Tilt” Schindler House in West Hollywood and artist Alison Knowles’ 1960’s intermedia piece The Play House is grist for Shelter or Playground-The House of Dust at the Schindler House, a series of performative investigations that involve new and recreated performances from around the world. U.S. participants include LA/NY-based Gerard & Kelly (Brennan Gerard and Ryan Kelly), LA’s Milka Djordjevich, UC Irvine’s Simon Leung, and Cal Arts students involved in the new works and in recreating historical performances from Merce Cunningham and Trisha Brown. This weekend’s free performance marathon offers multiple short pieces, the last of which begins at 6:30 p.m. A complete list at https://makcenter.org/programming/shelter-or-playground-performance-program. Djordjevich’s work repeats twice a month until June. For the rest, it’s see it this weekend or miss out. Details on the Schindler House, Knowles’ poem The House of Dust that inspired The Playhouse, the Fluxus avant garde movement in the late 1950s & 60s of which Knowles was part, and the extended endeavor running through June 2 that incorporates this weekend’s performances, and more at https://makcenter.org. Schindler House, 835 N. Kings Rd., West Hollywood; Sat.-Sun., Feb. 16-17, 2 p.m., also Sat., March 9 & 23, April 6 & 20, May 4 & 18, June 1, 3 p.m., free. https://makcenter.org. Milka Djordjevich, part of “Shelter or Playground-The House of Dust at the Schindler House. Photo courtesy of the artist. Among L.A. choreographers, Donna Sternberg has an impressive ten year history exploring connections between science and dance. Her work is never a literal translation, but always a thoughtful effort to interpret common threads. Under the banner Awe and Wonder, Sternberg and her company Donna Sternberg & Dancers are joined by three distinctive choreographic voices—Jay Carlon (contemporary), Malathi Iyengar (classical Asian Indian) and Banafsheh Sayyad (Persian Sufi). Each choreographer developed a new work inspired by conversations with a scientist in immunology, evolutionary bology, biomedicine or biology. Details on the works, the scientists and the choreographers at http://dsdancers.com. The Odyssey Theatre, 2055 S. Sepulveda Blvd., W.L.A. ; Sat., Feb. 16, 8 p.m., Sun., Feb. 17, 3 p.m., $25 in advance, $30 at door, $20 students & seniors in advance, $25 at door. http://aweandwonder.bpt.me. Awe & Wonder’s Banafsheh Sayyad. Photo courtesy of the artist. Organized by dancers/choreographers Oguri and Roxanne Steinberg, Façade of Time recruited 60 dancers, movers, actors and singers, both pro- and non-professional, for a series of workshops that on Sunday will unleash that horde in a performative event that will travel from Venice’s historic Grand Canal past the iconic arcade leading to Windward Circle (the heart of the Boardwalk with street performers, the skateboard park, tourists and locals) then culminate at the ocean just at sunset. The stated intent is to illustrate Venice’s diverse history, the current struggles with dueling waves of gentrification and homelessness, along with consideration of the arts as a potential source of healing the community’s many frictions. Starting at Venice Blvd. at the Grand Canal (route at https://www.bodyweather.org/faade-of-time. Sun., Feb. 17, 3:45 p.m. to 5:45 p.m., free. https://www.bodyweather.org/faade-of-time. Facade of Time. Photo courtesy of Body Weather Laboratory. While he may never seize public attention as ferociously as his transformation of Swan Lake with its male swans in feathered knickers, Matthew Bourne’s Cinderella displays the master’s uncanny ability to transform ballet into a theatrical experience that can run for weeks while most ballet’s barely extend a full weekend. Bourne retained the Prokofiev ballet score and the basic architecture of the fairy tale but as is his wont, set the action in WWII London during the blitz, reconsidered the fairy godmother as a male who is equally an angel of death, and moved the pivotal meeting from a palace ballroom to a kind of underground nightclub that actually existed despite the German bombings. Reviews from London suggest Bourne has tinkered with the choreography and other details since the original was seen here in the 1990s. Music Center Ahmanson Theatre, 135 N. Grand Ave., downtown; Tues.-Fri., 8 p.m., Sat., 2 & 8 p.m., Sun., 1 & 6:30 p.m., thru Sun., March 10, $30-$175. https://www.centertheatregroup.org/tickets/ahmanson-theatre/2018-19/new-adventures-matthew-bourne-cinderella. 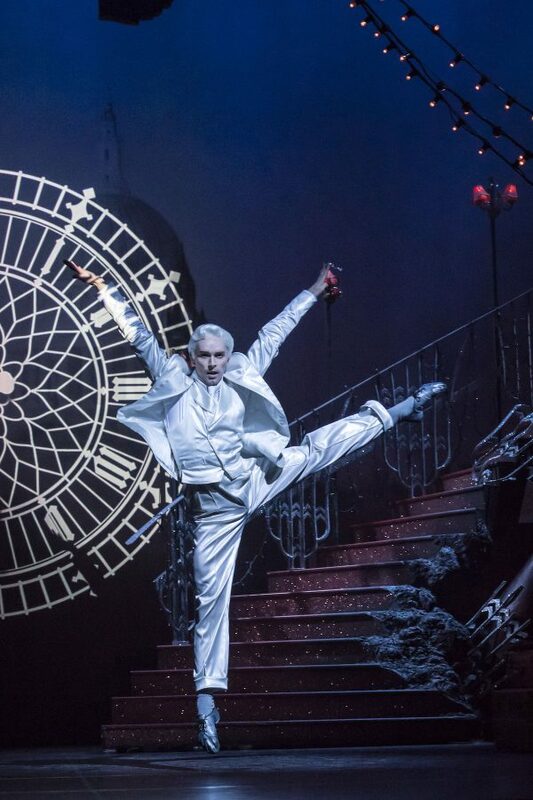 Liam Mower in Matthew Bourne’s “Cinderella.” Photo by Johan Persson. Reprising its recreation of five Fred Astaire and Ginger Rogers’ dance numbers, American Contemporary Ballet offers Astaire Dances 2: Fred & Ginger. This edition adds pas de deux from George Balanchine’s Who Cares? The performances include a show on Valentines’ Day. 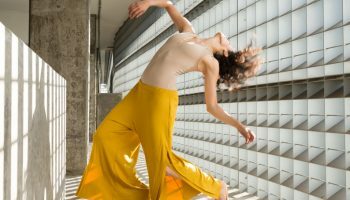 American Contemporary Ballet at Cooper Design Center, 860 S. Los Angeles St., Suite 1100, downtown; Thurs.-Fri., Feb. 14-15, 8 p.m., Sat., Feb. 16, 4 p.m., Sun., Feb. 17, 1 & 4 p.m., $45-$90. https://www.acbdances.com. American Contemporary Ballet’s “Astaire Dances2: Fred & Ginger”. Photo by Victor Demarchelier. In the last dance event of the season’s Fireside at the Miles series, the artwork of Sarah Wahl inspired this performance created by dancer/choreographer Angela Todaro for dancers Racquel Dirckze, Maraya Fisher, Rachel Hospers and Kayla Rose. Wahl’s paintings will be on view and available in a silent auction at intermission. Christine Reed Park, Miles Memorial Playhouse, 1130 Lincoln Blvd., Santa Monica; Sat., Feb. 16, 8 p.m., $5-$10. https://www.smgov.net/Departments/CCS/MilesPlayhouse/content.aspx?id=26314. Angela Todaro. Photo courtesy of the artist. Weaving together three stories about the struggle with grief after losing a loved one, Lineage Dance reprises Life After Death for the Living, now renamed Waking in the Mourning. Live music accompanies the dancers and artistic director Hilary Thomas’ choreography. Lineage Performing Arts Center, 464 E. Green St., Pasadena; Sat., Feb. 16, 8 p.m., Sun., Feb. 17, 7 p.m.; $25 presale, $20 students & seniors. https://www.lineagepac.org. Lineage Dance. Photo by Michelle Kolb. 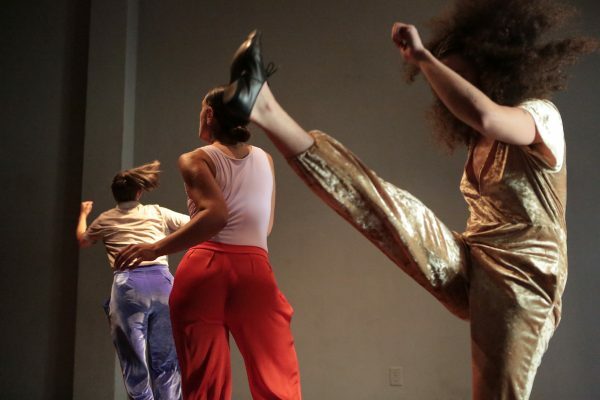 Known best for music performances, this venue has a growing rep for its dance offerings curated by Licia Perea including Black and LatinX choreographers in the BlakTina Festival and hip hop in Shut Up and Dance!. 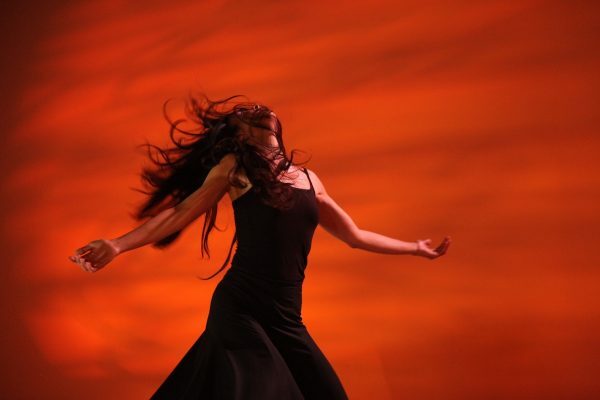 The venue expands into the world of flamenco co-produced with respected dancer Briseyda Zárate. Under the title Flamenco Tablao (loosely translated as a venue or the platform where flamenco is performed), the second installment of this monthly series finds Zárate joined by singer/dancer Manuel Gutiérrez, guitarist/composer José Tanaka. Bootleg Theater, 2220 Beverly Blvd. Echo Park; Sun., Feb. 17, 6:30 p.m., $25. https://www.bootlegtheater.org/event/1801110-noche-de-tablao-flamenco-los-angeles. Flamenco Tablao’s Briseyda Zárate. Photo courtesy of the artist. The long-traveling Luis Bravo’s Forever Tango brings its current crop of tango dancers and musicians to town. La Mirada Theatre, 14900 La Mirada Blvd., La Mirada; Sat., Feb. 16, 8 p.m., $20-$35. (562) 944-9801, https://cart.lamiradatheatre.com/single/SYOS.aspx?p=875. A bit of dancing, a lot of acrobatics, and a good dose of goofing around is a close description of The 7 Fingers. The popular Canadian troupe returns with RÉVERSIBLE which promises to turn everything, and possibly a good chunk of the cast, upside down. The Broad Stage, 1310 11th St., Santa Monica; Fri.-Sat., Feb. 15-16, 7:30 p.m., Sun., Feb. 17, 2 p.m., $60-$95. http://thebroadstage.org. 7 Fingers in “RÉVERSIBLE.” Photo courtesy of the artists. The training company Redondo Ballet offers its winter production of The Snow Queen. Redondo Beach Performing Arts Center, 1935 E. Manhattan Beach Blvd., Redondo Beach. Sat., Feb. 16, 3 & 6 p.m., $30-$35. https://www.redondo.org/cals/rbpac.asp, http://www.redondoballet.com/event/rbc-presents-snow-queen-2. 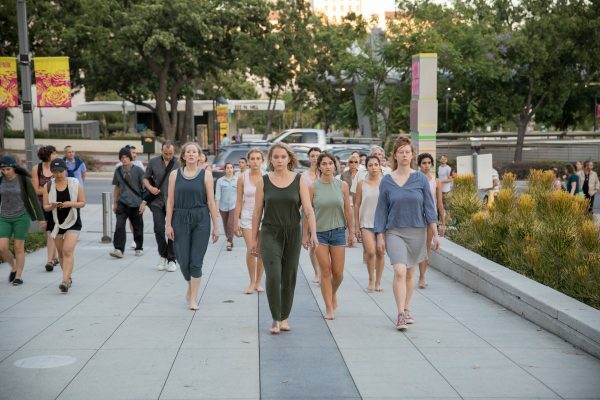 Orange county-based Backhausdance unveils its newest endeavor, a partnership with the Orange County Museum of Art dubbed Backhausdance With(in) OCMA, its stated purpose to cultivate emerging choreographers. The debut event, Keeping, is a site-specific work from Amanda Kay White, a founding member of Backhausdance. Orange County Museum of Art, 1661 Sunflower Ave., Santa Ana; Sat., Feb. 16, 2 p.m., free. http://www.backhausdance.org/events. Amanda Kay White in “Keeping.” Photo courtesy of Backhausdance. 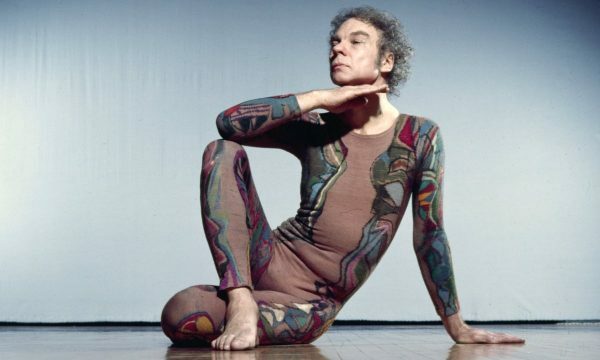 A harbinger of 2019 centennial activities celebrating the life and legend of the late modern dance choreographer Merce Cunningham, the exhibition Clouds and Screens, includes two large works by Andy Warhol and Charles Atlas, both artists associated with Cunningham’s company. The installation also includes two early videos of Cunningham’s work with performances and more to come during the exhibition’s run. Los Angeles County Museum of Art, 5905 Wilshire Blvd., Hancock Park; Thurs.-Tues., thru March 31, $25, $21 students& seniors (museum admission). http://www.lacma.org/event/memprev_merce2.